Exoplanet news Part 2: Exosaturn! Astronomers have found one of the most interesting exoplanets yet: one with a very extended ring system! The planet was discovered with the SuperWASP (Wide Angle Search for Planets) telescopes -- a UK project that employs low-magnification but very sensitive cameras which can observe large areas of the sky at the same time. It orbits a young star called 1SWASP J140747.93-394542.6, which is 420 light years away. The star's youth -- 16 million years -- indicates that the rings are probably the leftover remnants from when the planet formed. The planet and its rings were discovered using the transit method: looking for small dips in starlight as a planet passes directly between us and the star. This is how the vast majority of exoplanets are found. Usually, when you graph the brightness of the star over time, the dip in the plot as the planet transits the star starts suddenly, drops to some minimum, then jumps back up (see here for example). The whole thing is usually over in a matter of hours at most. But this planet took nearly two months to transit the star! And the dip was weird: there were multiple times the star dimmed then got brighter again, at one point having 95% of its light blocked. 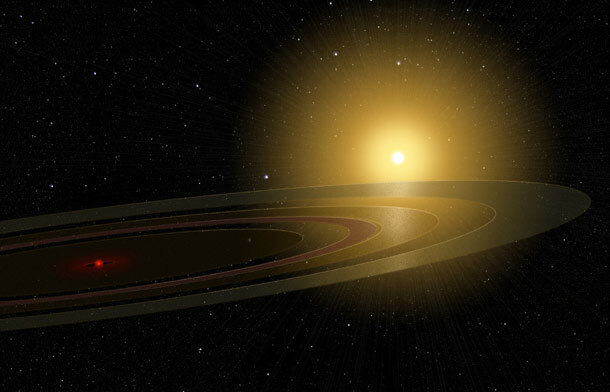 Even though the planet wasn't seen directly, the most obvious explanation is a ring system similar to Saturn's (though much larger), blocking the light. It must have gaps in the rings, like Saturn's do, to explain the starlight jumping up again over time. Overall, four rings were detected, and they stretch tens of millions kilometers in diameter! Saturn's ring are only about 300,000 km across, so clearly this planet must be much more massive than Saturn, and the rings denser. It may be a little unfair to compare it to Saturn at all; it's more like a super-Jupiter still surrounded by primordial debris. Unfortunately, we don't know how massive the planet itself is; you need Doppler data for that and none has been taken yet. The astronomers who discovered this system, of course, are looking into obtaining Doppler data. It's even possible the object is so large it's actually a brown dwarf and not a planet. Perhaps most intriguing about all this are those gaps in the rings. The easiest way to explain them is that there are objects there, moons, sweeping out the material in the rings. Saturn's rings have gaps for this reason. In fact, there are hundreds of gaps in Saturn's rings! These are caused by resonances: if a ring particle orbits twice for every one time a moon orbits, for example, the moon's gravity tugs on it every time it swings by, pulling it into a different orbit. Over time, all the particles in that orbit are gone, leaving behind a gap. If the planet itself is big, how big are those moons? Could one be Earth-sized? It's an idea that's been around awhile, but none has ever been seen... yet. All these super-Jupiters being found have a lot of gravity, and it's possible they have big moons. We're also getting better at detecting smaller objects, so it wouldn't surprise me if that announcement is made sometime relatively soon, too! I'll note that the idea of looking for rings and moons is more than an idea: the Hubble observations of the star HD 209458 I mentioned the other day were taken to look for moons and rings around that planet! None were seen, but astronomers will keep trying. There are a lot of planets out there, and one thing we've learned is that variety is the spice of nature.